A groundbreaking new campaign has been launched in India to challenge the deep-seated prejudice that tribal peoples are ‘backwards’ and ‘primitive’. Such attitudes are often used to justify the theft of their land and attempts to force them to change their ways of life. The ‘Proud Not Primitive’ campaign shows that tribal peoples are not stuck in the past, but have every reason to be proud of the self-sufficient and sustainable ways of life which they have developed over generations. 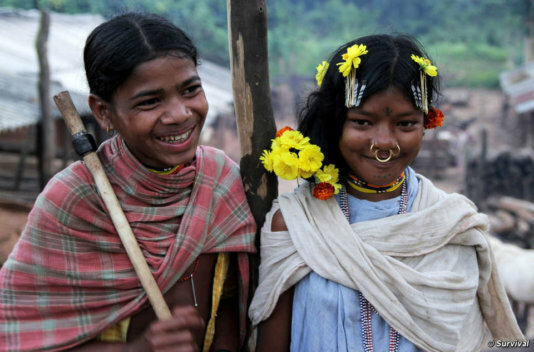 Descriptions of tribal peoples as ‘primitive’ and ‘backward’ are openly voiced in the media, by industry representatives and by government officials in India. This prejudice underlies much of the mistreatment that tribal peoples face: mass evictions from their lands and gross violations of their dignity and rights. There is a prevailing view that tribal peoples are ‘backwards’ and in need of ‘development’, that mega projects like dams and mines will ‘benefit’ them and that they need to be brought into the ‘mainstream’. The assumption is that tribal peoples do not know what is best for them. Their rights to their land and to choose their own futures are ignored. The ‘Proud not Primitive’ campaign aims to challenge these attitudes. Members of the public, Indian government officials, academics and the media will be encouraged to sign up to the campaign to build a movement to change the way tribal peoples are viewed in India. As long as these prejudices are allowed to prevail tribal peoples’ rights will continue to be violated. Tribal peoples’ rights to their land and to choose how they live must be respected.